Kia Ora and welcome to Travel New Zealand! New Zealand is a country of 15 unique geographical regions that offer stunning and diverse natural beauty: soaring mountain peaks, fiords, lakes, rivers, and active volcanic features. The islands are inhabited with many species of unique fauna and animal life, including the elusive kiwi, which has become the national symbol. New Zealand comprises of two main islands, the North and South Islands, separate by Cook Strait - a 30 kilometre stretch of water where the Tasman Sea and the South Pacific Ocean meet. With 15,134 km of coastline, New Zealand is a little less in size than Italy or Japan and a little more than the United Kingdom. 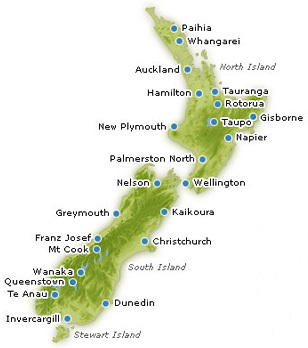 New Zealand has significant number of smaller inhabited islands including Stewart Island/Rakiura; Waiheke Island, in Auckland's Hauraki Gulf; Great Barrier Island, east of the Hauraki Gulf and the Chatham Islands. Known as the Adventure Capital of the World, it's no surprise that there's a vast range of activities to choose from; go bungy jumping, hop onboard a jet boat and travel down winding rivers, or enjoy an incredible hike through one of 14 National Parks. New Zealand's majestic mountains also provides world-class snowboarding and skiing snowboarding in winter. There is a range adventure tours, ski tours, eco-tours, small groups, event tours and independent travel tour options, to name a few of the many opportunities available to the visitor wishing to see New Zealand's unique beauty. New Zealand is sparsely populated but is easily accessible with developed transportation networks and modern tourism and visitor facilities. Our online information reservation system allows you to make reservations for accommodation, domestic air travel, walking the Milford or Routeburn Tracks, tours, rental car and campervan hire, bus, coach, rail, train and ferry travel reservations within New Zealand.